You have to be very quiet, and very still, and watch very, very, carefully. The Camouflage is difficult to see because it is...well, it's camouflaged. If you are motionless and focus your eyes just right you might see the heat waves outlining its deer like form. It's a gentle animal with succulent meat that many animals love to gorge on. Few people know of it because it is generally invisible. An expert at melding into its background it has been just recently discovered and documented although it has been known among women for centuries . It is an herbivore, gentle, but very wily and hard to catch. If you can catch one it has a lovely, long, soft, coat which can only be seen once it's been shorn or shed. Then the fur takes on its true color and lacking the particular chemicals and temperature of its owner becomes constant in its appearance. Shearing a Camouflage does not affect its life saving ability to hide and once shorn it can be sent on its way. The Camouflage does not do well in captivity. Efforts to domesticate them have failed and led to premature death and harsh coats unsuitable for fabric and knitting. Further, they dwell in hard to reach forests inhospitable to mortal men. However women have been able to penetrate these forests and come away with armloads of the fur, spinning and knitting the rare treasure into magic robes and mittens. Alas, although we recently went on an expedition to track down this elusive creature, we failed in our attempt (someone sneezed), and we came away with nothing. Posted by Anna Maria Junus (happy employee who will be going on an expedition of her own soon but will probably not find a Camouflage). 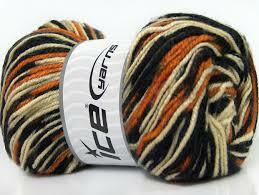 We carry or have carried yarns made from all kinds of different materials. Wool of course and acrylic, but also cotton, linen, silk, hemp, bamboo, cashmere, angora (both rabbit and goat), alpaca, camel, and llama. We've even had sugar cane and milk. Don't ask me how you can make yarn from milk. There's even a category of yarn called "other fibres". I don't know what plant or animal that comes from. 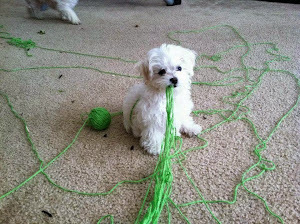 All those things are soft, just what you want from a yarn. 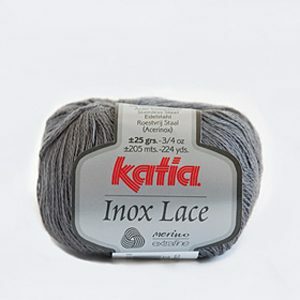 So how surprised am I to realize that we also have a yarn made with stainless steel. And it's not used for scrubbing pots. 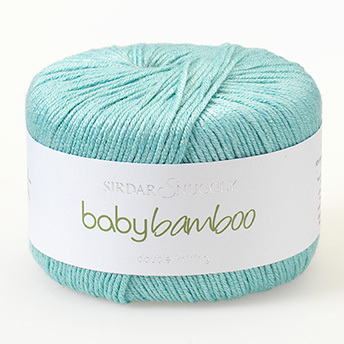 In fact, mixed with merino wool its soft and lovely, perfect for an airy shawl or tunic. Don't ask me how to do they do that either. Apparently steel is strong enough to make towering structures and soft enough to wrap a baby in. Who knew? Posted by Anna Maria Junus (happy employee who is sick while she writes this and apparently the cold in her head has affected the functioning of her mind). 1. It's the capital city of Canada. There was a huge fight about this. Toronto wanted to be named the capital. So did Vancouver and Calgary. But Ottawa was smart and waved knitting needles around threatening to skewer someone so Vancouver and Calgary said "you can have it." and went to their corners where they made toques and mitts. 2. It's the fourth largest city in Canada. Toronto won that fight when it threatened to take yarn and tie Ottawa up. Montreal came in second and then Calgary. Calgary decided it would rather be the largest rodeo in the world and proceeded to knit saddle blankets and mane ribbons. 3. It was originally named Bytown after John By who was responsible for the Rideau Waterway Construction project. When knitters think of a construction project they're imagining knitting fronts, back and sleeves, then blocking, and peppering the whole process with lots of swearing. As far as I know, John By was not a knitter so who knows what was going on there. Probably a lot of swearing. 4. The name was changed to Ottawa in 1855 because Bytown sounded like a warning to avoid the town all together. They wanted to present the idea that travelers ought to way lay for awhile but then realized that way lay is to forcefully stop someone - so they just wanted people to way. Think about it. Ought to way... Hey, I know it's dumb. But I cut the thread on my sock thinking it was finished and then I realized that I stocking stitched my cuff instead of ribbing it. 5. 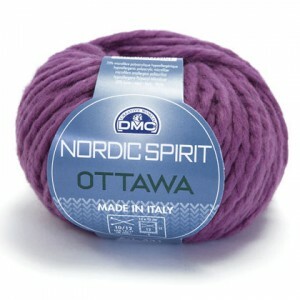 There are knitters and crocheters who live in Ottawa. 6. Many of them knit and crochet in French and English. 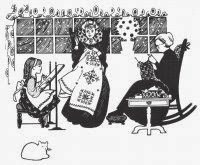 If you go to a knitting circle in Ottawa you will be expected to use both languages in the same sentence at the same time that you count your lace rows. They can swear in French and English too, and if you disturb them too much they can use their needles to stab you while they inflict curses on you in both languages. So here's our sale this week. It's Ottawa made in Italy. Because that makes sense. Posted by Anna Maria Junus (happy employee who can knit in Ottawa without knowing French or Italian). There is a rumor going around due to something I wrote which I want to clear up. The Crafty Lady is not moving. When I wrote that I was moving, I was writing about me personally, Anna, moving to a totally different world called Nanaimo. If you look at the bottom of the blog posts you will notice that I sign them. So although we appreciate the rush to get out here before our premature death - and by all means please keep it up - know that right now we are not moving and we are alive and well and planning to serve you for years to come. So you can all breathe. It just shows how important it is to read the entire blog post and not just the first line and the sale. You miss so much if you only do that. Like all my witty repartee. Now why would you want to miss out on that? Although now that I'm moving and have to leave the store, because the commute is just too far, you will no longer be able to read my witty repartee here on the blog. You'll have to search for it, or buy it instead. There is lawlessness going on around here! Did you know that it is illegal to label any textile "bamboo" only? You have to say "rayon made from bamboo" or "bamboo sourced viscose". Bamboo is a short fibre used to make houses, furniture and bridges, plus you can eat it too. So if you're stuck on a bamboo bridge, and you get hungry, you can eat the bridge, although that might not be a good idea because then you're left hanging. To make bamboo into a soft fibre you have to use chemicals, so it's against the law to just claim that it's made from bamboo. It's still a natural fibre, but it's a natural man made fibre, like paper or children. Well guess what we found in the store? 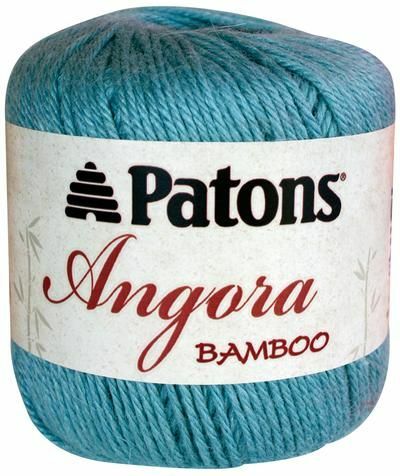 Illegal bamboo yarn. And from a well known, long time, highly respected name too! So we figure it's better in your house than in our store. I mean, really, is any federal authority going to be tossing your house looking for incorrectly labeled yarn? But at any moment, because we are a place of business, we could have a swat team break down the door (even though it's unlocked and it only requires opening) carrying assault rifles and demanding our illegal bamboo yarn. And because we believe that if you're breaking the law you have to do something legal to balance it out, we also have legally labeled yarn on sale too. Besides, it just makes the illegal stuff easier to hide in your house if you put it with the legal stuff. By the way, did you know that bamboo can grow three feet in twenty four hours? It's like that horror movie I watched as a kid where the plants grew through cracks in doors and windows and wound themselves around their hapless victims. So here you go. Our sale this week. Posted by Anna Maria Junus (happy employee who may or may not have illegal yarn in my stash - maybe I should check that).